Overnight work at the office didn't prevent me from taking a short side trip to the parade along ayala avenue to take a cursory look and some snaps before heading home early. Missed the Dinagyang performers but what the hey, was too pooped out to really care. Anyway, the parade is an appetizer for things to come, winding up to the 338th anniversary of Makati this coming June 1st. bro, nandun ka pala kahapon. 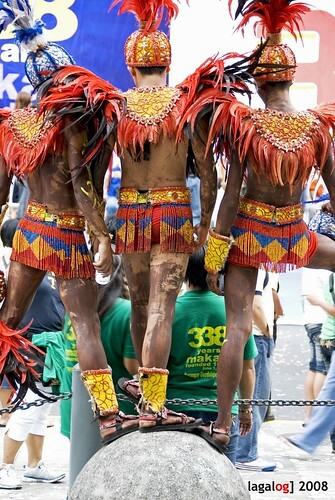 i was also there and i was able to see the dinagyang performance. ganda ng shots mo. i like this shot. ang galing ng pagkapwesto nila. napadaan lang bro :-) had an overnighter sa office and was just cooking up the passion to shoot kahit man lang snaps. i shot this in front of the stock exchange. i like shooting people watching the parade, including the participants themselves.